Club foot is also called talipes equinovarus. It is a congenital deformity of the leg occurring in 1 or 2 of thousand births. Males are more affected. Male female ratio is 2:1. One third of these cases are bilateral. There may be the absence of creases which is called arthrogryposis. X ray offoot in both anterior posterior and lateral view is indicated. Anterior posterior view is taken keeping the foot planter flexed for 30 degree. Then the angle between the 2 lines, one going parallel to lateral margin of calceneum and other going parallel tomedial margin of talus, is measured. Normally this angle ranges between 20-40 degree. This angle is called Kite’s angle. But in club foot this angle severely decreases, even falls to zero. 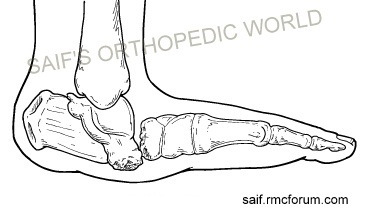 Lateral view is taken in forced dorsiflexion offoot. Then angle between 2 lines, one going through lower border of calceneum and other going parallel tolong axis of navicular, measured. This angle should be around 42 degree. In club foot it goes below 20 degree. At first manipulation and strapping is done as conservative treatment. Parents are taught how to do manipulation so that they can carry out this with strapping still in place. This should be supervised by orthopaedic surgeon or physiotherapist who will alter the strapping when needed. As far as the manipulation is concerned, equines should not be tried to correct first, it may cause ‘break’ offoot at mid talar region, which is called ‘ROCKER BOTTOM DEFORMITY’. At first, although forefoot is supinated, it should be supinated to align with hindfoot which is more supinated. 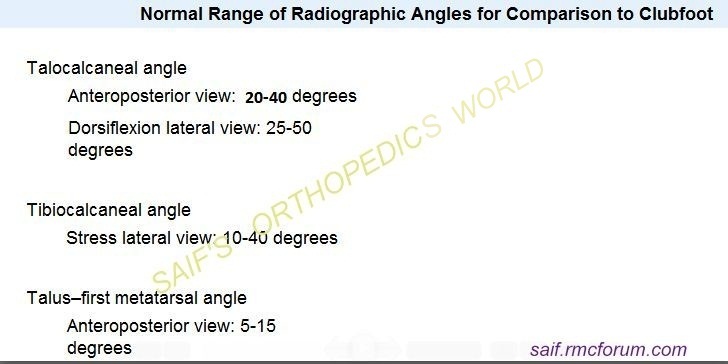 When alignment is done, then supination is corrected. Then equines is corrected, which is aided by percutaneous Achillis tendon lengthening. Resistance cases will declare themselves within 8-12 weeks. Then surgeon will choose operation or continuing conservative treatment. In club foot operation, various types of incisions can be made. 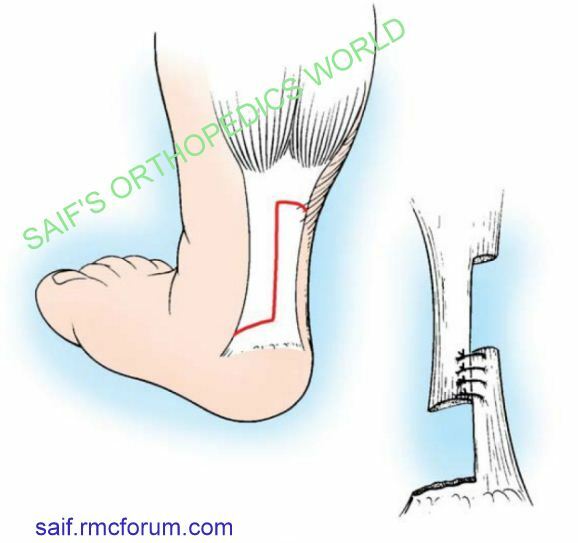 A transverse incision at heel which is continued anteriorly both at medially and laterally (cincinatti incision) or an incision at posterolateral aspect offoot and a separate incision medially (carol incision) can be made. Posterior aspect ofcapsule of subtalar and ankle joint is released. Cancenofibular ligament is cut which is the key structure for club foot. Tendon of flexor digitorum and flexor hallusis longus needs attention. Achillis tendon is cut in Z shape for lengthening. Superficial part ofdeltoid ligament should be released keeping the deep part to keep ankle stability. Interosseus ligaments should not be cut, otherwise it may cause overcorrection. Forcorrection of forefoot origin of intrinsic muscle and planter fascia is released. K wire is seldom given in subtalar and talonavicular joint. K wire and cast is kept for 6-8 weeks which is followed by ‘hobble boot’ or custom ankle foot orthosis. Exercise is recommended until active dorsiflexon or skeletal maturity is obtained. Relapsed club foot is associated with scarring of previous surgery. 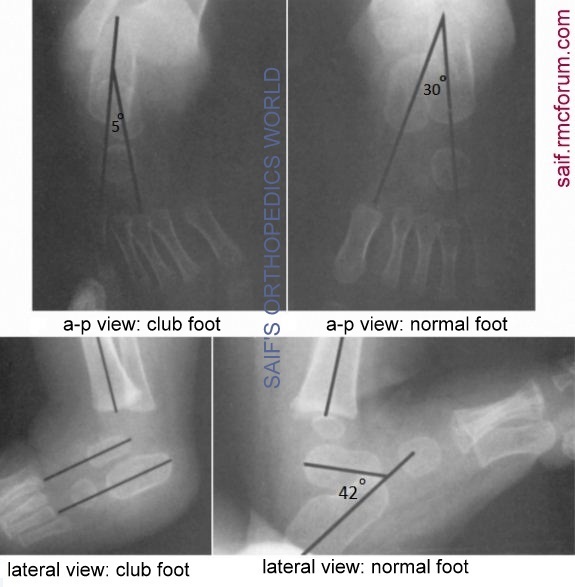 To treat relapsed club foot triple arthrodesis may be needed. Calcetocuboid fusion or sometimes ccuboid enucleation(Dilwyn Evans) is done. Calcaneul osteotomies may be done in the form of lateral closing wedges or lateral translation. Split of tibialis anterior is transferred to dorsum ofbase of 4th metatarsal and tibialis posterior is transferred to dorsum through interosseus ligaments. But tendon transfer is indicated only if the joints offoot are mobile. Sometimes Illizarov apparatus is used but this is painful. need to have a chat with you please. Sir, shouldn’t the deformity be Plantar Flexion of the foot? Because it’s Equinus Deformity? Under the clinical features, you’ve mentioned – Dorsiflexion of the Foot.